Dead Bear? No! Dead Cow! 04.03.2005 - How now, brown cow? Dead, that's how. I received several phone calls about a dead bear just off Rt. 417 near the Conway exit. One person said that it was a 12-foot dead bear. These calls piqued my curiosity, so I resolved to see the giant dead bear. During my normal day of nuisance wildlife control work, as I traveled along Rt. 417, I remembered to stop and take a look. I saw several cars pulled off to the side of the road on the northbound side (where the dead bear was), and traffic slowing on the other side of 417 as well. I became very excited, with a rapid heartbeat and sweaty palms and even a bit of shaking. I was about to see a giant dead bear! Very exciting! 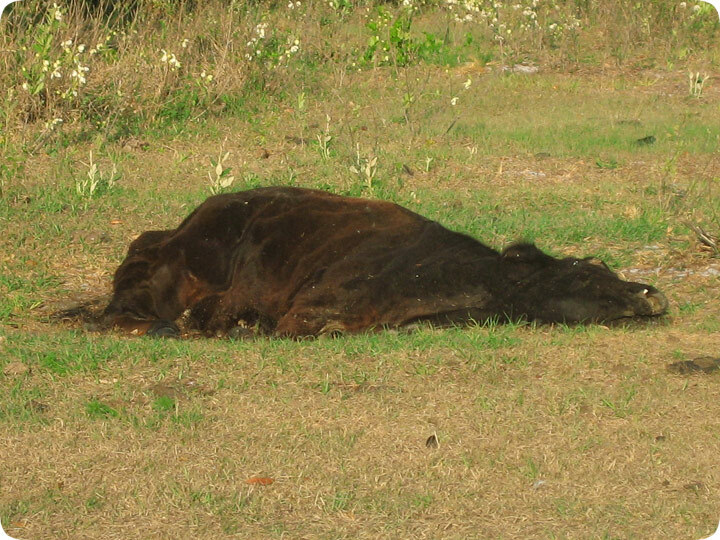 I parked on the side of the road, jumped out, and saw this dead cow. That's right, a dead cow. A boring old, plain old, run of the mill dead cow. I've already seen dozens of dead cows! Hundreds probably! And here was yet another one. Yawn. No wait, not yawn, scowl. Why had several people called me to report a dead bear. Were they that dumb? Yes, yes they were. They mistook a large cow-shaped animal dead in a cow field for a dead bear. I dejectedly got back in my truck and drove off. I guess a dead bear will have to wait for another day. Get professional help: Visit my Nationwide Pro Directory of dead wildlife removal experts.